Isla Isabela, located in the western Galapagos Islands, is one of the newest geological land masses in the archipelago. 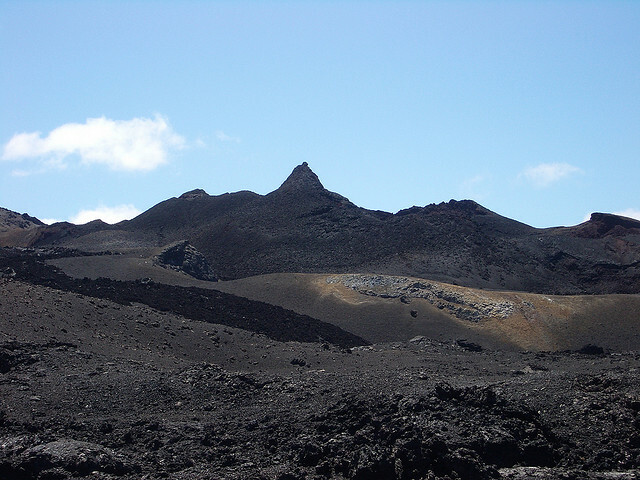 If you have experienced the eastern islands, heavily eroded over the millennia by wind and waves, you may find the baked lava terrain surrounding the volcanoes on Isabela in stark contrast. It is rugged and challenging. 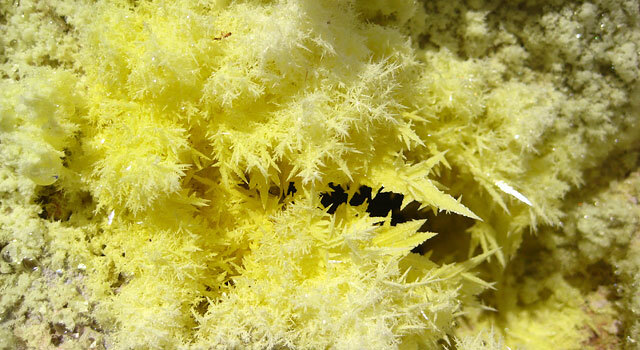 It displays different colors; different minerals catch the light; it is mountainous and stark; it is intriguing at every turn. Isabela is also unique because it grew not from one volcanic eruption, but by the integration of six separate underwater volcanoes. 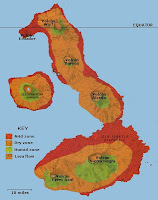 It is the largest land mass in the island system, accounting for 60% of the total land area. Moreover, due to its size and the fact that it arose from the sea as a result of multiple different natural occurrences and eruptions, its landscape is varied and it has many individually interesting tour sites and attractions. This is the first of three posts I will write about Isabela Island. 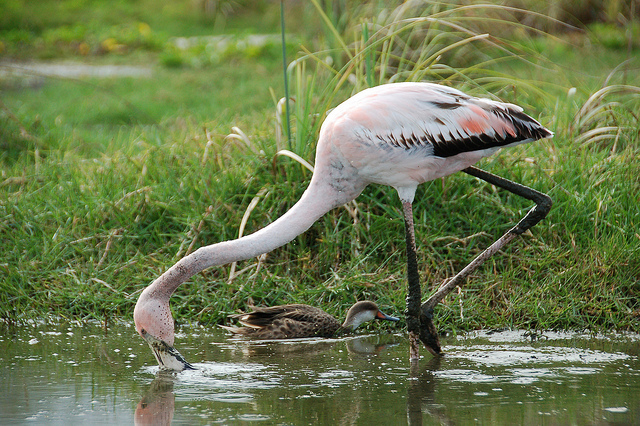 Here, I focus on the remarkable visitor sites accessible from the main town of Puerto Villamil. Get ready - you are about to experience everything from blue footed boobies to steps carved into a volcanic hillside, from flamingos to a bustling town. 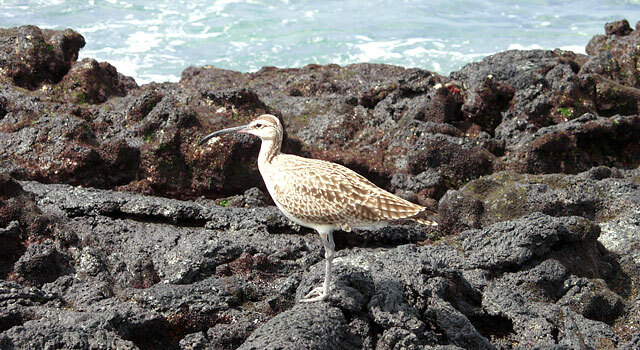 Indeed, each visitor to Isabela will experience this enchanted ground from a difference perspective, and, like the Galapagos Islands themselves, Isabela has something to offer everyone. 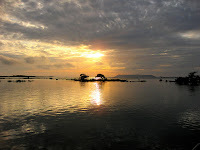 Our tour of the vast resources of Isla Isabela begins in the town of Puerto Villamil and continues to the many intriguing visitor sites accessible from this hamlet of just 2200 souls. In Part II, I take you to the magnificent beaches, coves, inlets, mangrove forests and snorkeling sites that surround this diverse island and are accessible only by boat and usually only by cruise ship visitors. 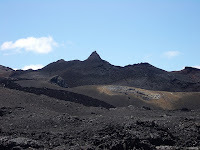 In Part III, I focus on the challenging and intriguing hiking opportunities that await those with a sense of adventure who are eager to examine the Isabela's astonishing volcanoes and experience the moonscapes, lava formations, calderas on the land and vistas of the island and ocean from atop this remarkable island. Puerto Villamil, located on the southeast coast of the island, is the Capitol of Isla Isabela. Though a small town, with a population of just about 2200 people, its harbor is frequently filled with sailboats and private yachts on their way to the Marquesas Islands. There are many interesting and unique sites for visitors within walking or driving distance from the town and several charming hotels and lodges in which to stay and experience the local culture. If you do choose to stay in town and travel to the nearby sites, you will not be disappointed. Be sure to get good directions and to distinguish those sites that require a certified National Park Guide from those that you may visit on your own. The town is large enough to support some shopping and dining opportunities as well. 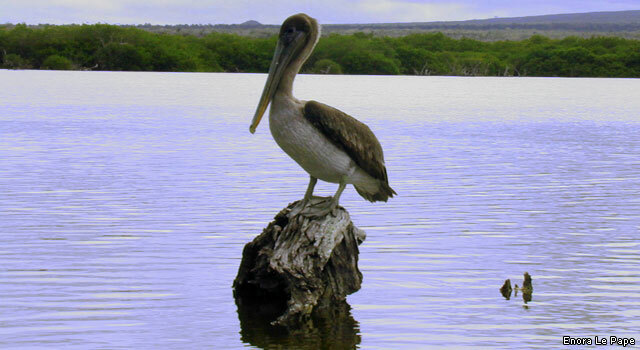 You will find the main port surrounded by extensive, white sandy beaches with lagoons and wetlands on its borders. 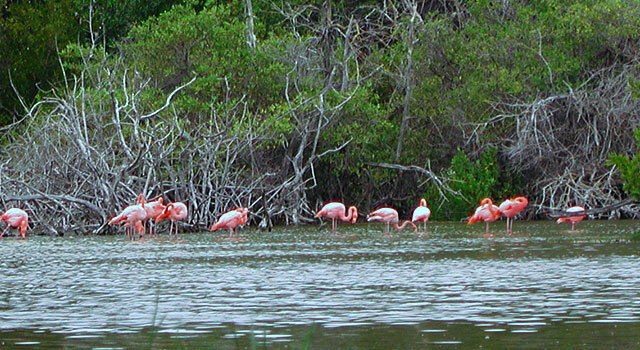 The nearby sites, to which I provide more in depth information below, include Flamingo Lake, Mango Viewpoint, the Tortoise Breeding Station, the Wall of Tears, the Wetlands lagoons, Cueva de Sucre, Las Tintoreas, Concha de Perla and many swamps and mangroves, which are the home to a variety of bird species. 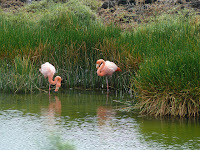 Flamingo Lake, just as the name suggests, is a lagoon which houses not only an array of coastal and sea birds, but also the largest concentration of flamingos in Galapagos. Pictures are worth a thousand words in this case. I'm told that everyone loves to go to the San Diego Zoo in California to see their superb collection of flamingos at the entrance. I have to believe that is nothing compared to the real thing in real life in their natural habitat. 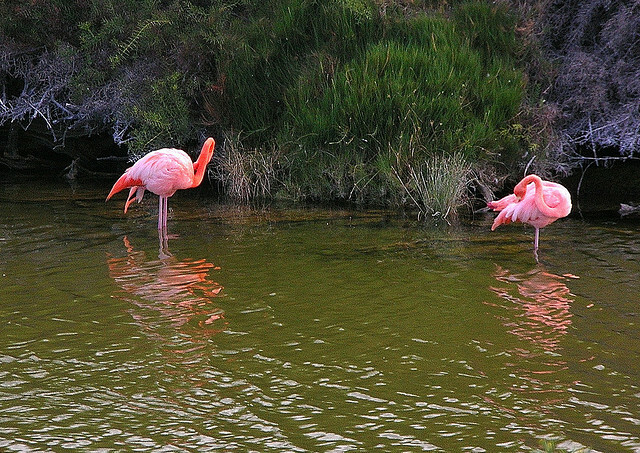 Flamingo Lake really is a site to behold. 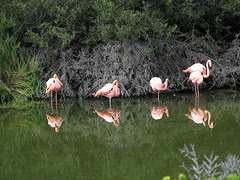 All photographs of Flamingo Lake are from Creative Commons courtesy of, respectively, NH53, Dallas Krentzel, jdegenhardt, ccarlstead, jdegenhardt and sly06. 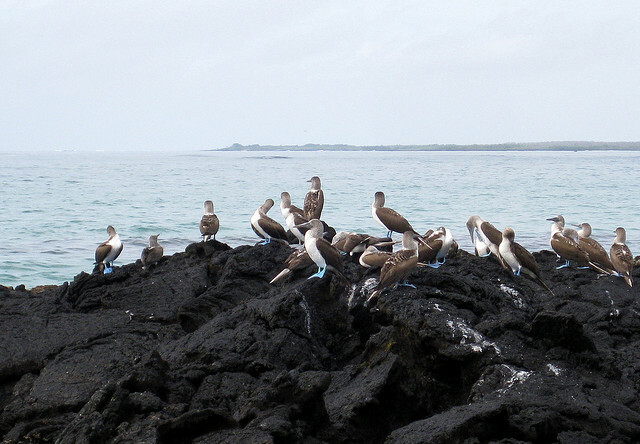 Thank you all for sharing these beautiful representations of this gorgeous Galapagos visitor site. Cerro Orchilla: From this lookout point, accessible via a staircase, you can see spectacular scenery including the bay and the town of Puerto Villamil, Sierra Negra Volcano, the Cerro Azul Volcano, multiple islets and rocky outlets. 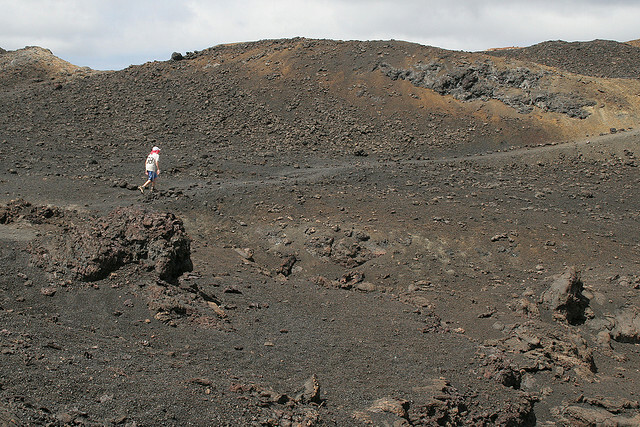 El Estero: This is 227 meter path of lava rocks, 1.5 meters wide. 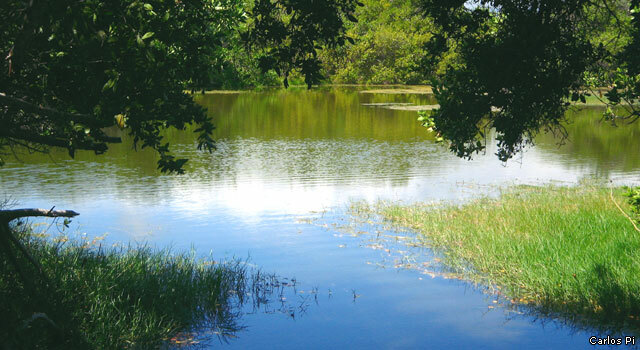 Here, you are free to picnic and view the scenery and wildlife. 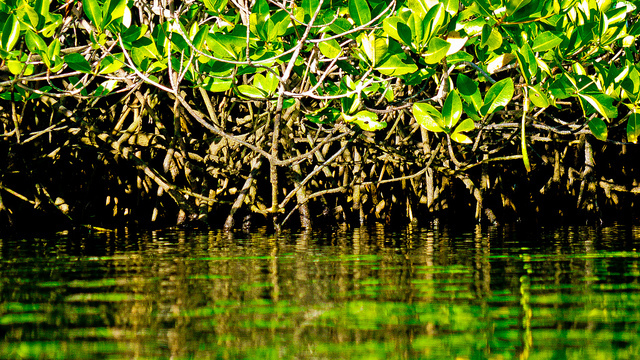 This is a particularly important trail because of its juxtaposition to the mangrove eco-systems of Isabela Island. 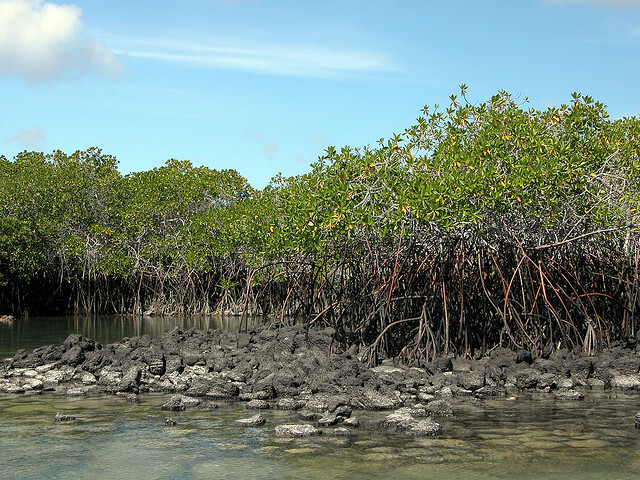 Four species of mangrove are present, including the largest black mangrove trees anywhere in the Galapagos. 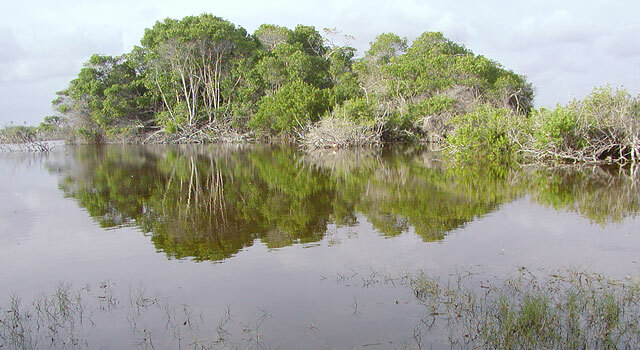 There is also a small majagual forest. 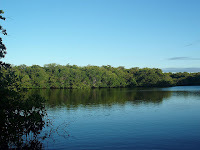 El Estero is related to the stories and legends of the penal colony era on Isabela. There is also a freshwater spring that, at low tide, forms a river that flows into a sandy bay for observation of sea birds and marine life. 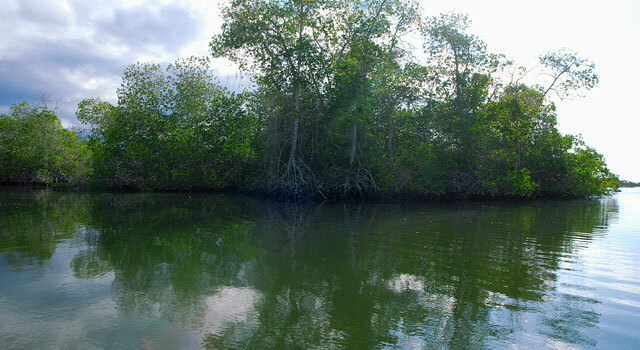 La Poza Escondida: The main attraction along this path of stone and wood is a mangrove forest. Poza Redonda: This equally beautiful pathway, 50 meters long, is comprised of lava plates leading to a pool formed inside a collapsed lava tube. 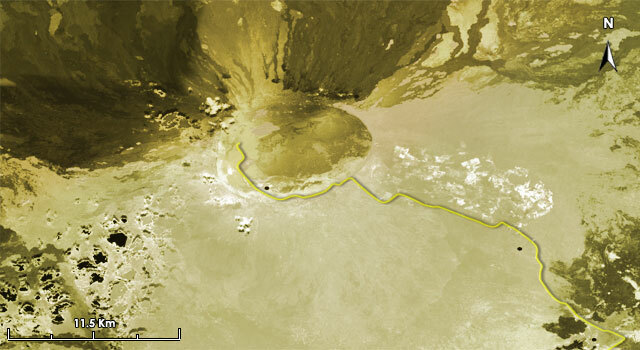 Tunel del Estero: Another lava tunnel will be found at the culmination of this 75 meter path consisting of lava plates and ending in a staircase. 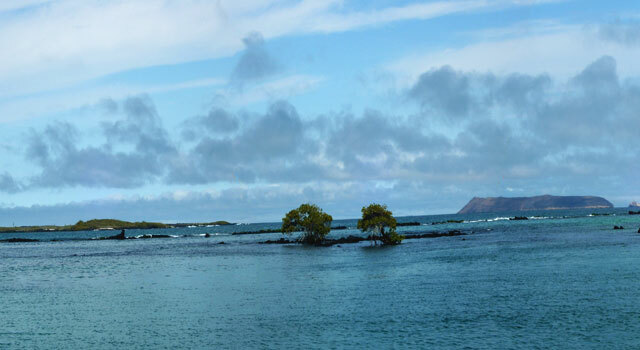 Above the tunnel you can see the intertidal landscape that offers a tapestry of Galapagos Sesuvium between "El Túnel del Estero" and Love Beach. Love Beach: This rocky beach and access to the sea is a site frequently used by the community of Isabela. Los Tunos Viewpoint and Pozas Verde: These two paths have several lookout points for observation of bird and plant life. 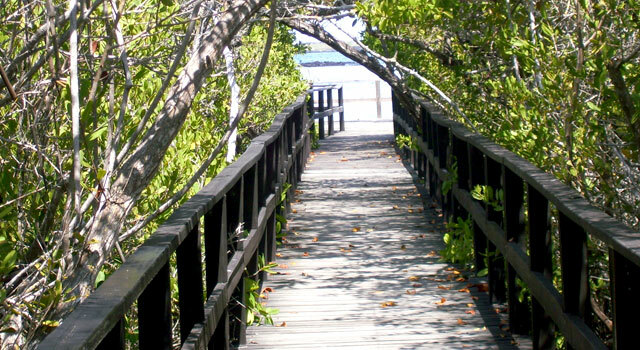 La Playita: This path leads to a small beach that is part of the greater beach in Villamil. 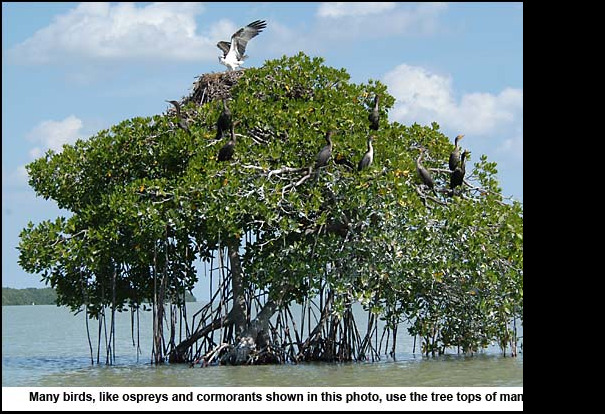 The main attraction of the Wetland sites is the variety of flora and fauna can be observed. Mango Lookout is, as the name suggests, a magnificent location to take in the surrounding area from a high vantage point. 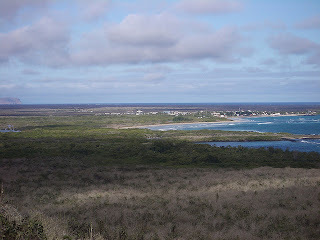 The viewpoint is about 9 kilometers from Puerto Villamil located in the island's agricultural area. The reward for hiking to Mango Lookout and climbing the trail and staircase onto its stilted wooden platform is the awe you will feel when you experience the stunning vista of the southern side of Isabela Island. Surrounded by yellow warblers and mango trees, otherwise unseen in the Galapagos, this is a gorgeous site for photo opportunities. 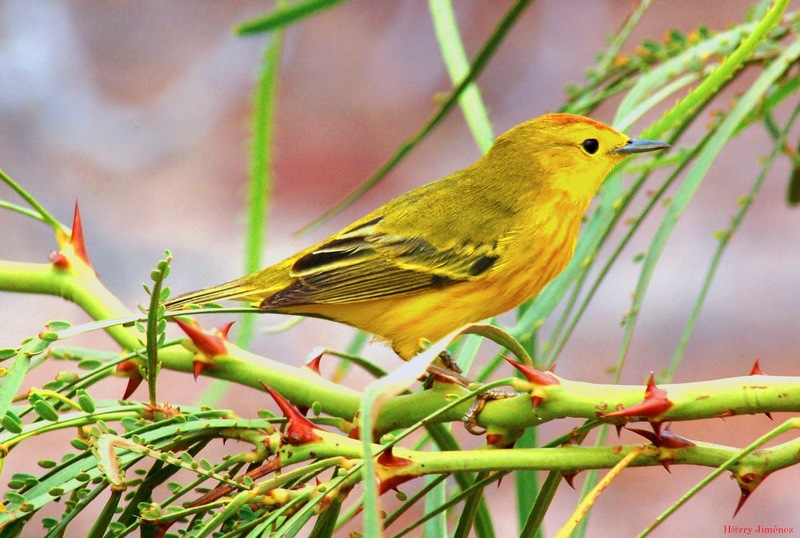 On the way to your destination from Puerto Villamil are areas of vegetation indigenous to Isabela, as well as several bird species, among them various finches. This site is also historically significant in terms of the human development of Isabela. This is the former location of the gravel mine from which the roads and highways on Isabela were constructed. Additionally, the road to Mango Viewpoint was used by early settlers of the island and then by the convicts who arrived to this island. Run by the National Park Service together with the Charles Darwin Research Foundation, the Tortoise Breeding Center on Isabela is accessed by walking or driving about 1.5 km from Puerto Villamil. 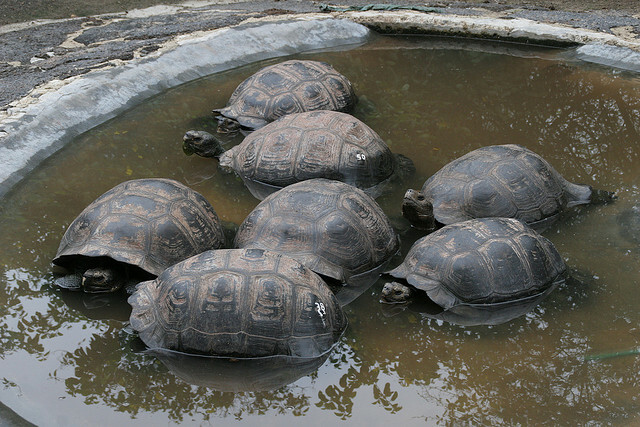 Many different species of tortoise are represented here, including those from Volcans Sierra Negra and Cerro Azul, both located on Isabela Island. 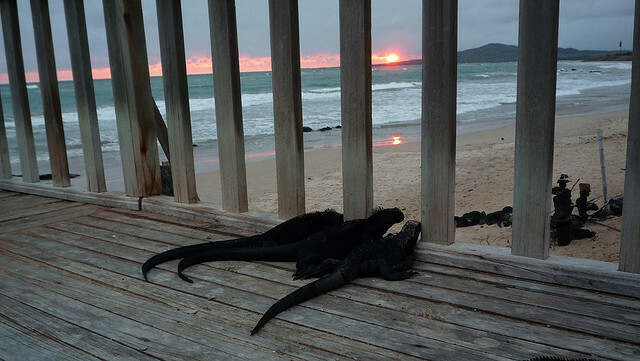 The breeding program has been very successful with multiple - although not all - species. 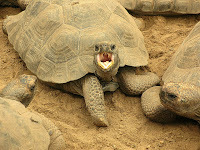 There are currently about 330 juvenile and adult tortoises at the center. Baby tortoises are kept in captivity until age five before release to their natural habitats. The tortoises are fed a vegetarian diet three times weekly and drink water from small artificial ponds built within the corrals. The Center has beautiful gardens consisting of native plants. 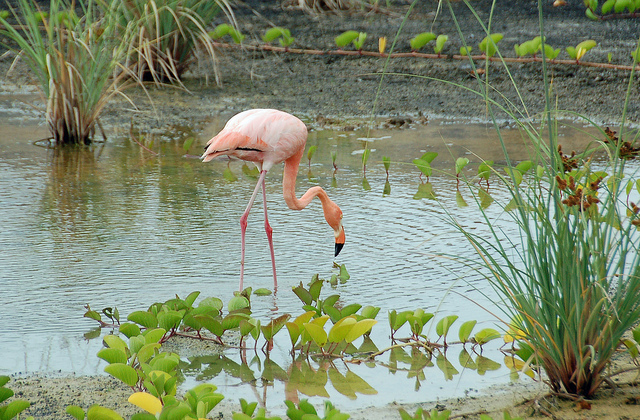 Unlike a typical visit to the main breeding center at the Charles Darwin Research Center, a visit here is peaceful and quiet; often you will be alone to wander through this lovely preserve. If you are interested in learning more about the tortoise population at Isabela’s Breeding Center, follow this link to the Galapagos National Park Service’s statistical information. 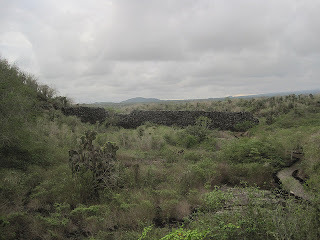 The Wall of Tears is a historic site in Isabela. Between 1946 and 1959, Isabela was a penal colony, where prisoners were forced to build a wall with huge blocks of lava as punishment. The wall is 100 metres long and 7 metres high. Due to the arduous labour and harsh conditions in which the prisoners lived, this site is known as the Wall of Tears. Many bloggers have written eloquently about their emotions when visiting the Wall of Tears. For me, pictures tell the story. If you are interested in reading more, I suggest either of these two links. The Grown-Up Gapper: Isabela's Dark Past or Visiting Isabela, by John Santic. Sucre`s Cave is a very recent addition to the visitor sites available on Isla Isabela, accessible only by land and not visited by cruise ships. 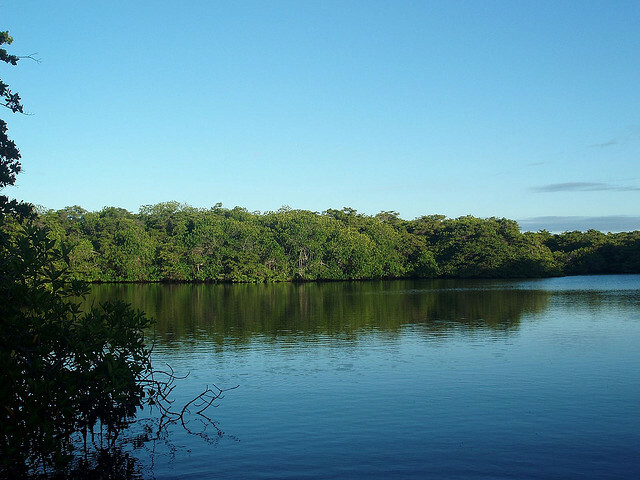 It is located in the agricultural zone just about 14 kilometers from Puerto Villamil. Situated in an area of reforestation and conservation, Cueva de Sucre consists of a path of about 480 meters underground, running through a strip of vegetation and across a lava tunnel before ending at a nursery installation used to reproduce indigenous and endemic flora and fauna. 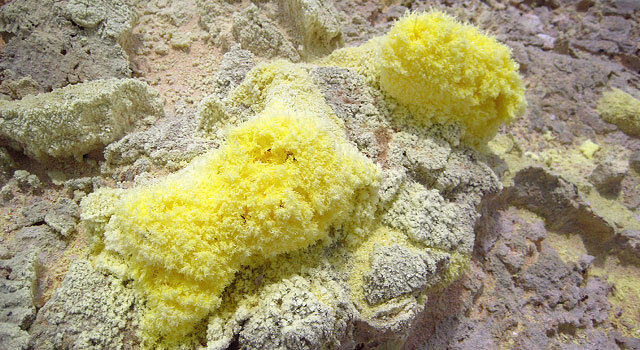 Inside the cave, there are places where you can stand and examine the interesting volcanic formations. For those adventuresome spirits, there are some very tight spaces that only those without claustrophobia and with a true love for spelunking will choose to experience. 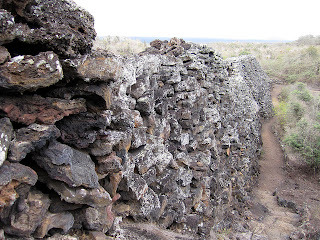 The trail is built entirely of volcanic materials. 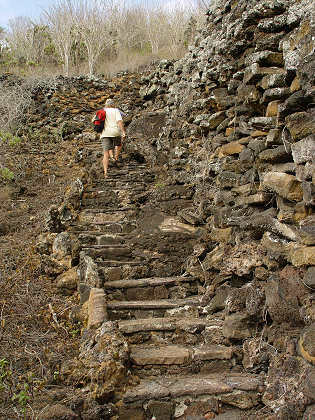 The nursery itself is maintained by the Galapagos National Forest using primarily volunteers and students who can apply their skills and interests to helping maintain the ecological balance of the island. 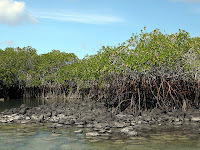 This is a vital spot for teaching about the flora of Isabela Island. 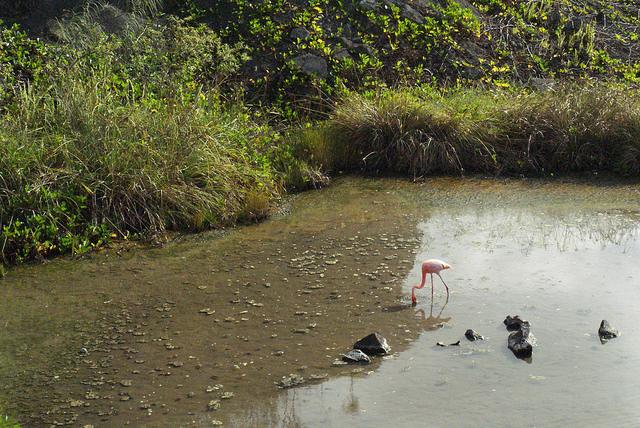 The visitors' site Concha de Perla is in Puerto Villamil. It is a public site, no guide required, and a reasonable bicycle ride. In fact, though you cannot ride your bike on the Perla walkway itself, bike racks are provided. 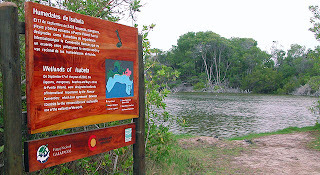 Access to the site is by a wooden walkway that runs through a mangrove forest up to an intertidal pond. At this shallow and calm bay, you will see just how crystal clear the water can be. Here you may see sea turtles, penguins, sea lions, many tropical fish and rays. Concha de Perla is structured as a kind of hollow circular enclosure of natural rock, which is fed by the sea with the changing tides. 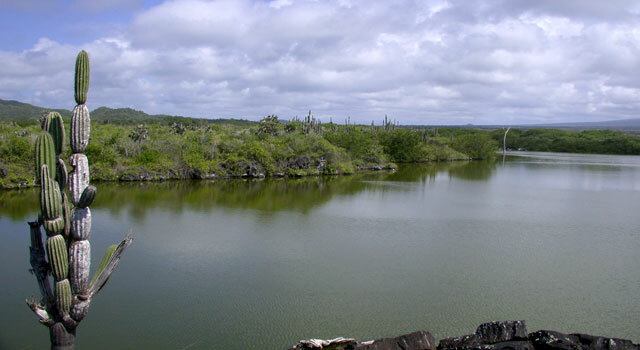 Locals use this site as a place for swimming and snorkeling. 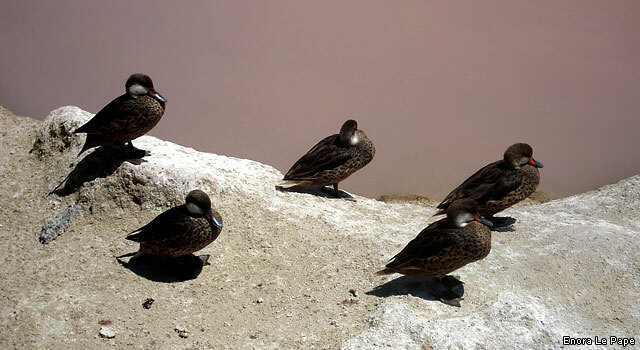 In the mangroves and rocks present along the walkway to the Laguna Concha de Perla, there is a small colony of sea lions. An excellent resource for snorkelers near and around Concho de Perla is divinginthegalapagos.com. 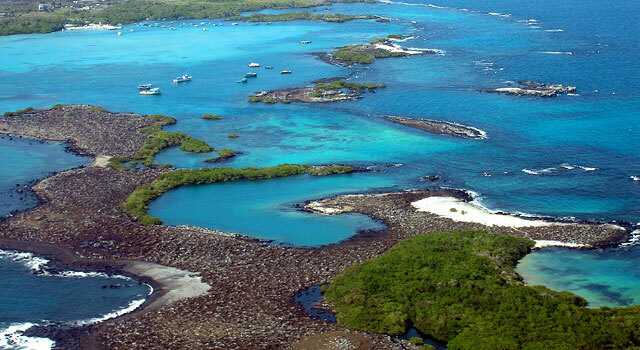 A great site for both snorkelers and photographers is Las Tintoreras, a small stretch of lava islands just moments by panga from the main dock at Puerto Villamil harbor. 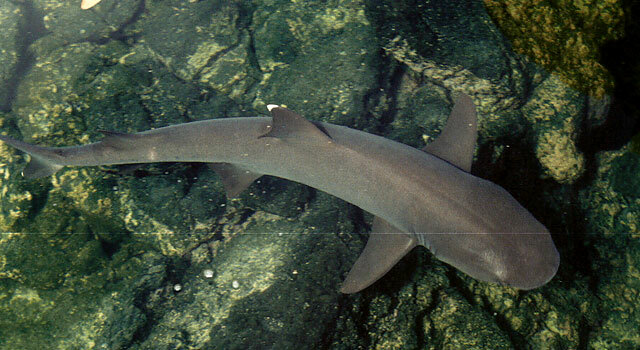 The name itself means White Tipped Reef Shark and this site is aptly named - you simply won't believe your eyes when you are faced with literally dozens of Sharks swimming in small pools. One of the main pools - actually a narrow channel in which the sharks congregate during high tide - is just about 1 meter deep, so you are really able to see the sharks from above. They seem to be lazing on the bottom, barely moving. Certainly, they are not in a hurry to move away from human visitors to their territory. This is their primary breeding ground - their headquarters so to speak! At Las Tintoreras the snorkeling can be just amazing, particularly when you are able to greet the penguins and swim with the sea lions. 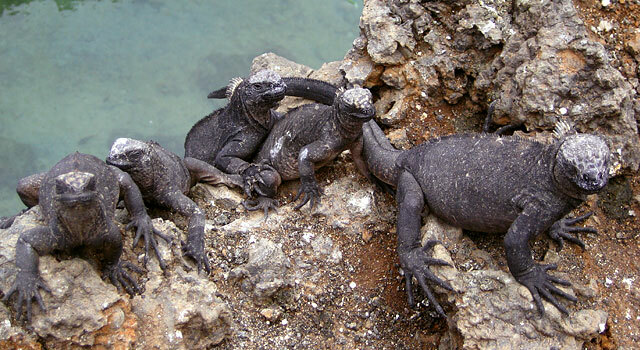 In addition, you are likely to encounter Sally Lightfoot Crabs, iguanas, rays and sea turtles. One of the fabulous sights at Las Tintoreras are the huge iquanas, literally hundreds of them, huddled on top of one another, just soaking in the sun. 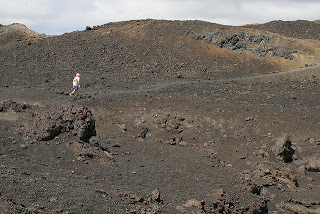 The trail at Las Tintoreras is AA lava and there are both white and black sand beaches. 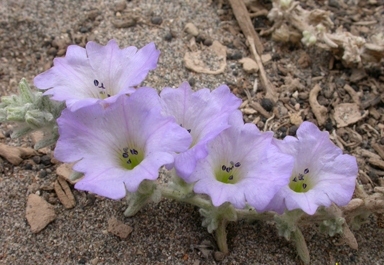 In addition to the amazing marine life, you may see here a rare endemic plant called Nolana Galapageia. 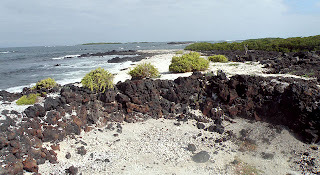 Most of the trail is lava AA, and you will have access to both a white sand beach and a black stone beach. La Calera is just minutes by panga from the pier in Puerto Villamil. You will experience a wet landing and then a short trail across some tidal pools. 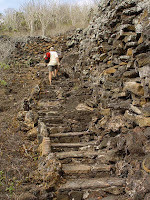 The limestone, sand and stone at La Calera has been used by island settlers as building material. 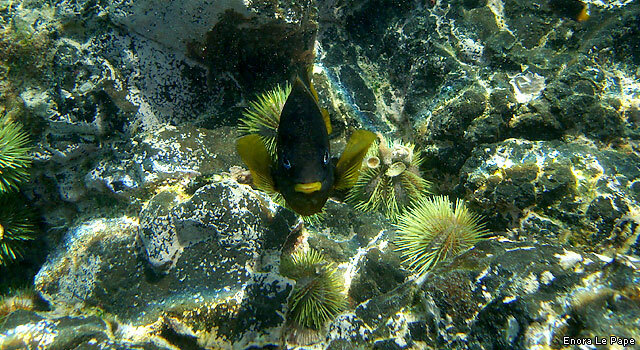 This is a lovely locale in which to snorkel in a quiet lagoon. It is very similar in characteristics to Las Tintoreras. 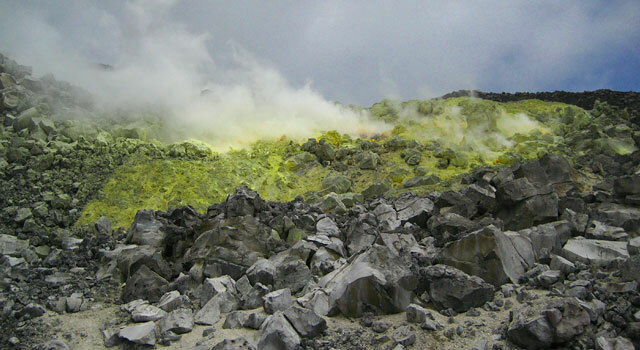 Located to the west of Sierra Negra Volcano, and beginning at the same departure point as that for Volcan Chico, the hike to the Sulfur Mines is unique and can be quite haunting because of the coloration of the lava, the isolation of the site, the starkness of the trails and the mist and fog that can hang over the terrain at certain times of year. This site is rarely visited and not for the faint hearted. It's deep into the interior of Isabela and about a 45-minute drive from Puerto Villamil, then quite a trek on horseback to the site itself. You are allowed to camp and hike at this site, provided you have received permission and are accompanied by a certified guide. Isabela Island is a wonderland. 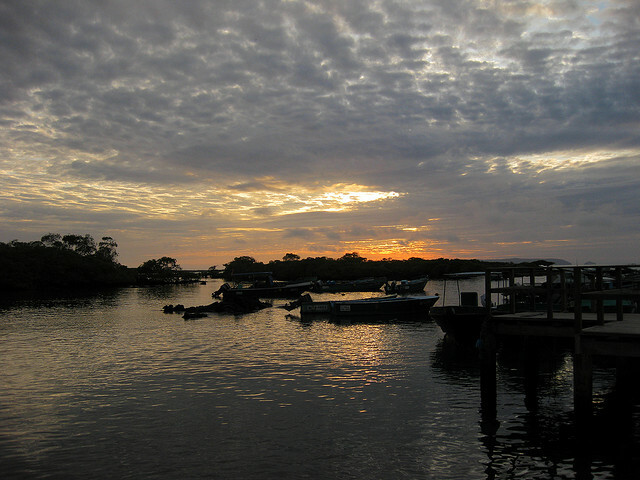 In this post, I have provided you just a taste of the diversity and beauty accessible from the town of Puerto Villamil. Now, with your eyes wide open, prepare to be awed by the extraordinary and unique locations that await you as you travel around the island by boat - that will be the focus of soon-to-be published Part Two of my Isabela Island guide. 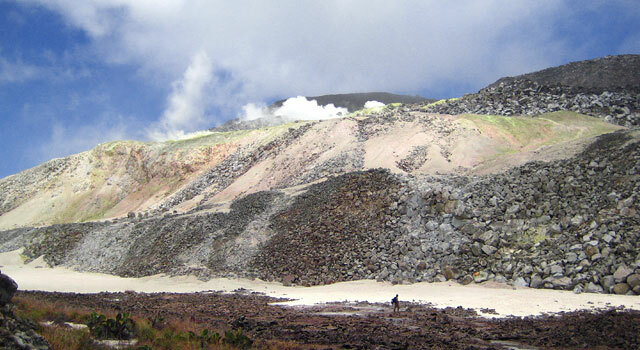 Then, more rapturous and inspiring sites await you at Isabela's six volcanoes, the subject of Part Three.